My, how things have changed since the original Space Invaders debuted more than thirty years ago! Looking back, the game seems so simple, it's hard to believe it was a national obsession. Move your ship beneath aliens, push the fire button, repeat, that's all there is to it. 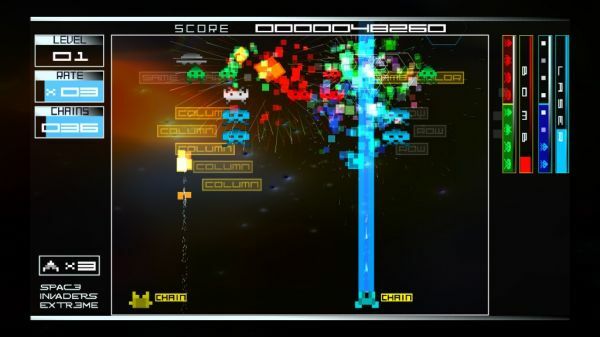 When Space Invaders Extreme was released on Xbox Live Arcade, I knew I had to get it for nothing more than nostalgic purposes. I was curious, too, at how my kids would react to it. In this era of open world gameplay, realistic 3D graphics, and cinematic storytelling, would young gamers get bored too quickly? The first test was to see if the kids would be interested when I was playing. After school one evening, we all went our separate ways: one kid to feed the dog, the other to his room to play with his toys. 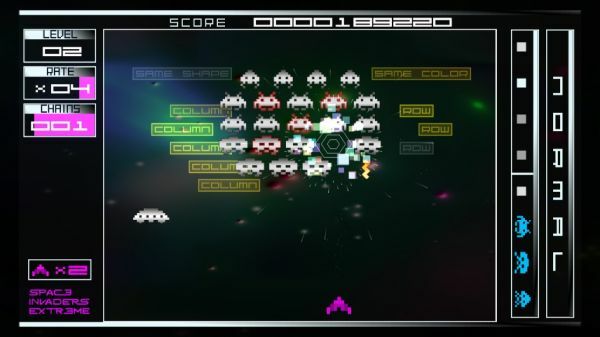 I fired up the Xbox 360 and started up Space Invaders Extreme. The walls started pounding in time with the deep bass of the EXTREME techno beat. I quickly turned it down before things started falling off the walls. (Anyone else notice thatSIE is louder than most other games?) Even just a few seconds of the loud music was enough to get my youngest son running to investigate. He immediately perched on the couch, entranced by the hypnotic action. After a few moments, my oldest came back inside, and he immediately checked it out as well. Only a few minutes later, the inevitable question was asked: "Hey Dad, is this three player?" Inwardly, I let out a sinister "muahahahaaaaa!" The two had fallen into my trap, just as planned. Soon, the three of us started a local co-op game, and proceeded to lay down the smack on our poorpixelly foes. We probably played for at least an hour straight, and made it through three bosses on our best attempt. After so much of the psychedelic, scintillating graphics, our eyes and trigger fingers needed a break. Both of the kids "ooh"-ed and "ahh"-ed that first night, which was a bit surprising but pleasing nonetheless. Every couple days, we'd give it another go, in between disc swaps, or when we just had a few minutes to get a quick video game fix. We still haven't managed to beat it, but it's not for lack of trying. 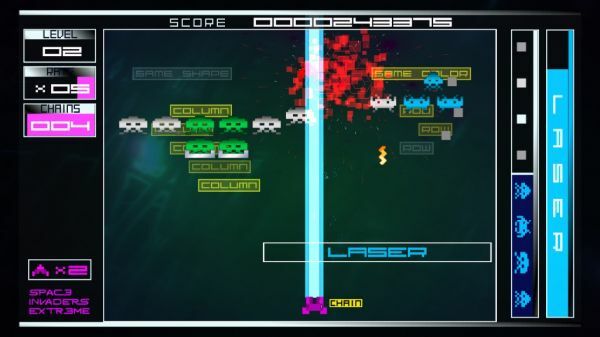 Space Invaders Extreme was a big success for us, and worth every MS Point. Page created in 0.2252 seconds.